The Municipality of North Grenville and the Veterans Way Memorial Committee are pleased to extend an invitation to the public to attend the formal dedication of Veterans Way (roadway) in honour and remembrance of the late Owen Fitz'Gerald on Saturday, June 2, 2018 at 2:00 p.m. 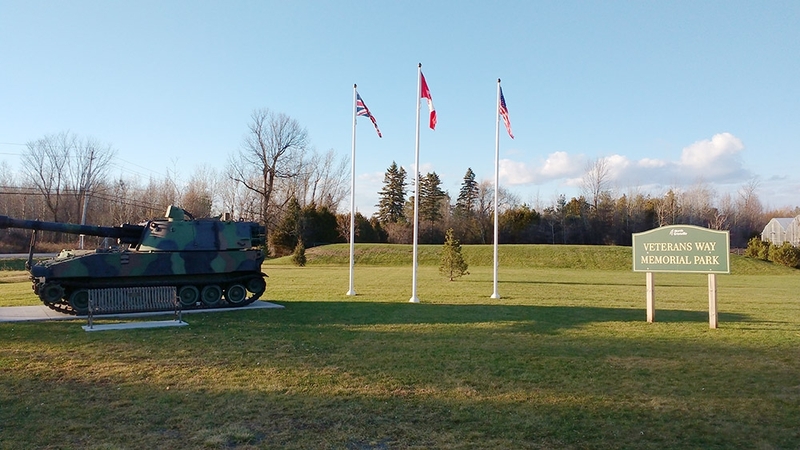 The ceremony will be held on the grounds of Veterans Way Memorial Park, which is located at the Ferguson Forest Centre (275 County Road 44), just north of the North Grenville Municipal Centre. Owen Fitz'Gerald, was a mechanic, high school faculty teacher, mentor and friend to many. He was a Councillor on the last Oxford-on-Rideau Council and went on to become one of the first elected Councillors to serve on the Municipality of North Grenville Council. Fitz’Gerald was also a multi-term Director and Past President of the Ferguson Forest Centre Corporation Board of Directors and served on the Executive Committee of the Royal Canadian Legion Kemptville Branch #212. Fitz’Gerald was best known in the community for his efforts to ensure that those who served and continue to serve in Canada's Armed Forces were remembered for their service and sacrifices. To that end, Owen became the founder of Veterans Way and later chaired the Veterans Way Memorial Committee, with the successful goal of creating the Veterans Way Memorial Park at the western gateway to the Ferguson Forest Centre. Veterans Way was established in 2002 as a site of remembrance and reflection in honour of the men and women who had served their country in the military. The roadway is a tree-lined living memorial and each year new names are added to the Honour Roll. In recognition of his many accomplishments, Owen was posthumously honoured by the Mayor and Council with the adoption of Resolution C-2017-180 dated November 27, 2017 which reads "Be it resolved that the Council of the Municipality of North Grenville hereby dedicates Veterans Way in memory of the late Owen Fitz’Gerald.” A permanent commemorative plaque expressing that sentiment will be unveiled at the ceremony. The list of guest speakers for the event includes MPP Steve Clark, Mayor David Gordon and Carl Doucette, President of the Ferguson Forest Centre Corporation. A special invitation to attend this ceremony is extended to representatives from the Army, Navy and Air Force Veterans in Canada, Royal Canadian Legion Zone G-3 and the NATO Veterans Organization of Canada, as well as past and serving members of the Canadian Armed Forces. Please be advised that there will be limited seating available for those planning on attending the ceremony. It is suggested that attendees consider bringing a lawn chair or portable seating device if they wish to do so. In keeping with Municipal regulations that apply to this event, the public is requested to refrain from bringing animals to the Memorial Park site. In the event of inclement weather, the ceremony will be held indoors at the Pte. Blake Williamson Memorial Hall (formerly the Kemptville Armoury) at 25 Reuben Crescent, Kemptville, Ontario.